The penny has the least value of United States currency. The definition of least is the lowest in importance or the smallest of something. 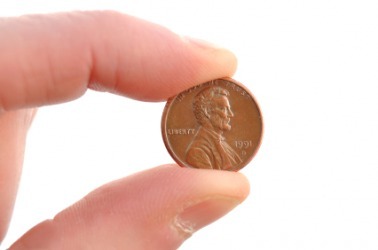 An example of least is one penny being the lowest value U.S. coin; the least amount of value. An example of least is someone doing the smallest amount of work necessary; the least necessary. "least." YourDictionary, n.d. Web. 20 April 2019. <https://www.yourdictionary.com/Least>. the smallest in size, amount, importance, etc. Lowest in importance or rank. Middle English from Old English lǣst ; see leis-2 in Indo-European roots. superlative form of little: most little;The smallest amount of [something uncountable]. [W]hen the context"”unemotional statement of everyday facts"”is taken into account, at a less price ought to be at a lower price, and a lesser prize ought to be a smaller prize.